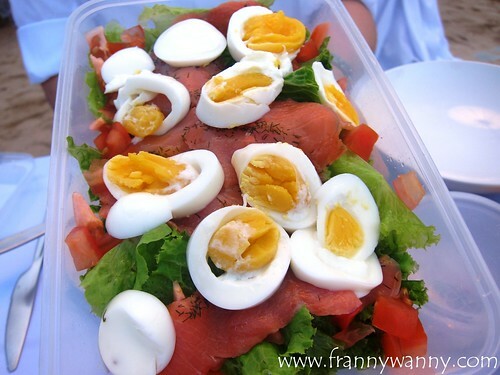 26 years ago in Paris, France, a man named François Pasquier invited a couple of his friends to an exclusive picnic party at the park. 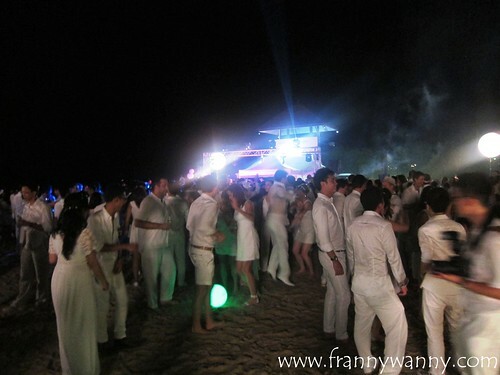 In order to find each other, all guests were requested to come in white. 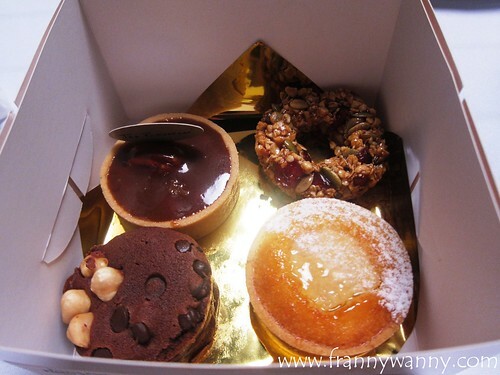 This gathering became so successful that eventually more and more friends would join. 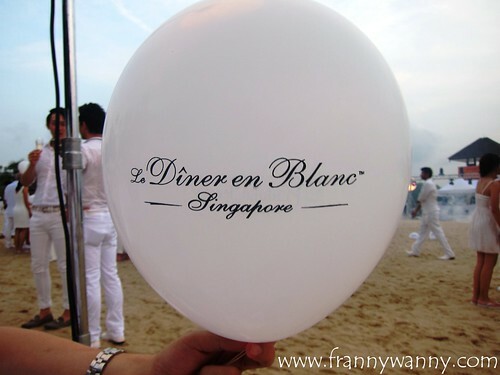 Today, Diner en Blanc is currently conducted in over 40 cities all over the world and Singapore is one of them. Lucky me! I have been following the Diner en Blanc Singapore page for a while now and when I chanced upon an announcement saying that they're looking for volunteers, I immediately sent my application in with zero idea of what the job will entail and what are the things to expect. It was a spur of the moment act and to this day, I seriously had no regrets of doing so. As one of the bus leaders, I was tasked to be the point person for my group of 44 diners ensuring the they all follow the guidelines, arrive at the designated time and bring all the things needed. I got to admit that the list wasn't simple. 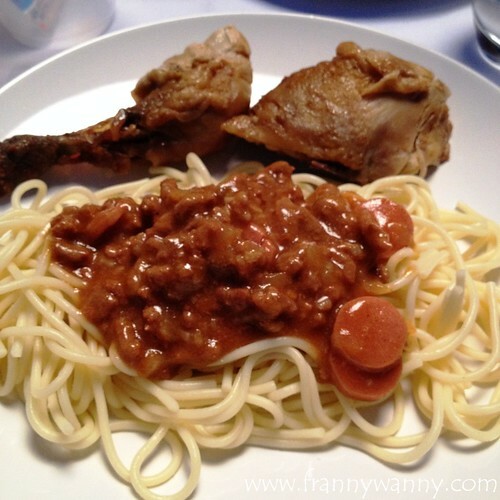 Each couple has to bring their own 3-course meal or they can opt to purchase from the DEB store for a certain price (S$88++), white plates and bowls (disposables are not allowed), utensils, table decors, tables and chairs (also in white) and a whole lot more. We began our preparation a month in advance with the help of our families in Manila who took care of making sure we have a pretty white picnic basket, a white table cloth, white table napkins, white votive candles and even my blings and accessories for the night too! It was indeed a full production and I'm so glad that we pulled it of. Diner en Blanc is a classy, upscale all-white picnic party so it was just perfect that we had to our meeting place in style. Thanks to Uber Singapore who gave all participants free credits to use. Yay! It was my 3rd time to use Uber and I highly recommend it. 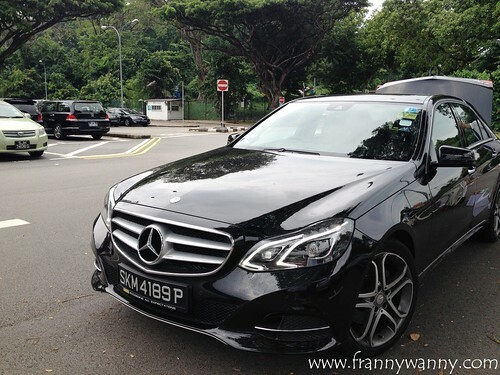 The compartment of our Mercedes Benz was big enough to fit all our things and inside, the leg room was also very spacious giving both Paul and I the comfort all throughout our quick ride to Seah Im. We also were given a bottle of complimentary bottle of water each. Check out my bus! Paul and I happily welcomed our bus mates as they come. I'm so glad that Paul was there to be my co-leader. I seriously wouldn't be able to do it so smoothly without him. :) Indeed, we make a great team! So the rule of the event is that all participants will meet at a certain point and we have these buses that will take us to the secret location. At this point, none of us still know where the secret location is. The only clue that I got from my Group Leader Frank is that it's just a good 20 minute ride from where our meeting point was. My guess was at the Singapore Botanic Gardens as they've done the Marina Barrage and at the Art Science Museum before. 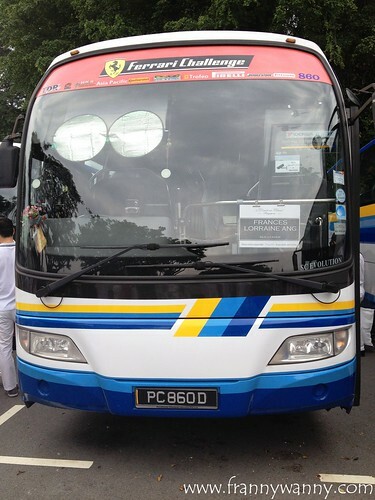 Well, as the bus made a right and headed towards the Sentosa Gateway, I could feel a sense of excitement inside the bus. 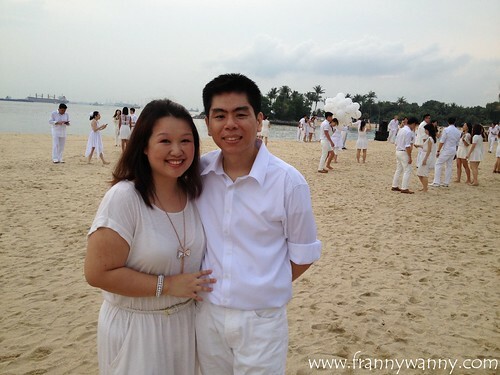 Our location was so near yet we're so excited as having our all-white picnic by the Sentosa beach is just so cool! As we got to our designated area, my group quickly set-up our individual tables. I'm so proud of my group as everyone was just so cooperative and organized. In no time, we were all seated complete with our food containers and pretty white balloons tied to our chairs. For our drink, since Paul and I are not fond of alcohol, we got a bottle of our favorite Welch's Sparkling Red Grape Cocktail and a bottle of Mineral Water too. At 9pm, after we're all done with dinner we headed down to the beach and lighted up our sparklers. It was such a photogenic moment, don't you think? So romantic to have everyone beautifully dressed in white with sparklers on hand. The party continued with more dancing. I'm so glad that my date was game enough to dance with me and the music was just so nice! I really went wild when they played "I gotta feeling" by the Black Eyed Peas, my ultimate favorite party song! What a great experience and I'm so glad that I had the opportunity to be part of this. I woke up with muscle-ache from all that walking and lifting but hey, it was all worth it as I got to meet 40+ new friends here in Singapore while enjoying the night with my handsome date too. Till Diner en Blanc 2015! hahaha you're so cute jane! 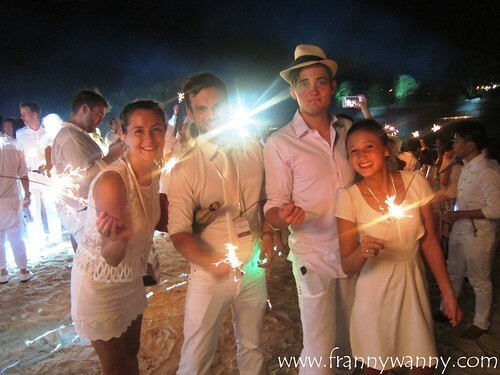 pero alam mo this was indeed a great experience, wish Diner en Blanc would go to Manila too!